This 12-week-old female infant born at term after an uncomplicated pregnancy presented to the emergency room with a fever, rash, acrocyanosis of the fingers and toes, and lethargy. The white count was 34,000 (normal 6,000-17,500); hematocrit was 20.9 (normal 28-42) and hemoglobin was 6.2 g/dl (normal 9-14 g/dl). Thrombocytosis was present with measured at 916,000 /µL. Erythrocyte sedimentation rate (ESR) was 50 mm/hr (normal 0-20 mm/hr), and the C-reactive protein (CRP) was normal. Echocardiography, performed because of suspected congestive heart failure, demonstrated abnormal coronary arteries with aneurysms, measuring up to 5 mm in size. 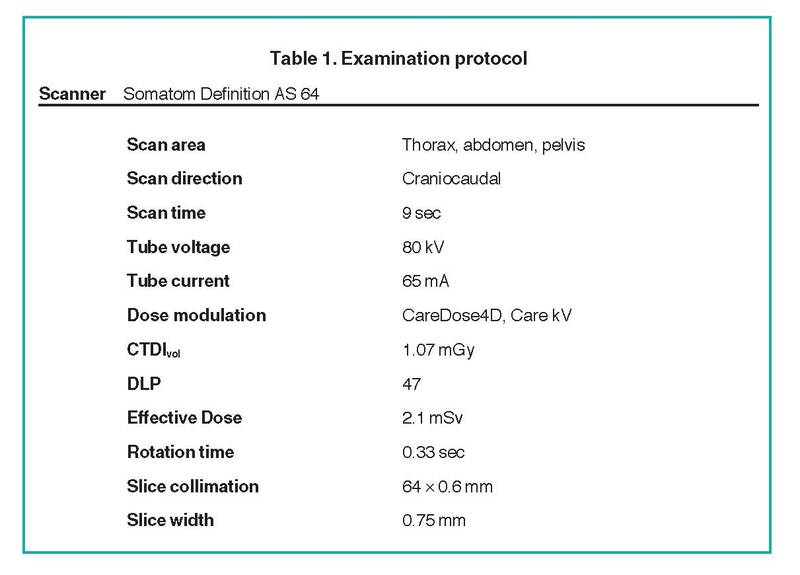 A computed tomography (CT) scan of the chest, abdomen, and pelvis was performed on a Somatom Definition AS 64 row scanner (Siemens, Forchheim Germany). Images were obtained following the administration of 13 mL of Optiray-350 nonionic contrast material (Covidien, St. Louis, MO) (Figure 1). The acquisition parameters were 0.6 mm collimation, 65 auto mAs, 80 auto kV, pitch of 1, and a gantry rotation time of 0.33 sec. CT dose index (CTDI) volume was 1.07 mGy and dose length product (DLP) was 47 mGy·cm. Using the conversion factor (0.044 mSv/(mGy·cm) for trunk CT examinations, effective dose (E) is estimated to be 2.1 mSv (47 mGy·cm x 0.039). Over the next few days, progressive ischemia and gangrene of the fingers and toes occurred. Kawasaki disease is a febrile, inflammatory disease of childhood of unknown etiology, usually seen in children between the ages of 1 and 5 years.1 It is diagnosed clinically since there are no specific laboratory tests for diagnosis, although thrombocytosis and an elevated erythrocyte sedimentation rate and C-reactive protein may be noted. Classically, 4 of 5 clinical criteria must be present in order to establish the diagnosis: 1) bilateral nonsuppurative conjunctivitis (i.e., conjunctival injection, 2) erythema of the lips or the oropharynx mucosa including the tongue (i.e., “strawberry tongue”), 3) edema of the hands and/or feet with periungual desquamation, 4) a nonvesicular truncal rash, and 5) cervical lymphadenopathy. Children under 3 months of age account for less than 2% of patients.2 Younger patients, especially infants, often have only 2 or 3 of the classic diagnostic features of Kawasaki disease. Because there are incomplete criteria, the condition is often called incomplete or atypical Kawasaki disease. 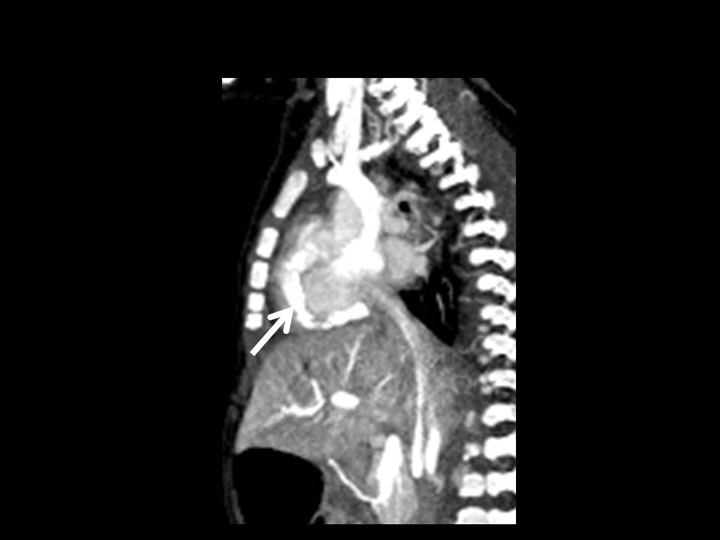 In classic Kawasaki disease, coronary artery aneurysms occur in 20% to 25% of children.3 Incomplete Kawasaki disease in young infants is more likely to be associated with coronary aneurysms and peripheral gangrene.2 The frequency of coronary aneurysm is 79% in infants under 6 months of age compared with 44% in infants 6-12 months of age. The left coronary artery is involved more often than the right coronary artery. 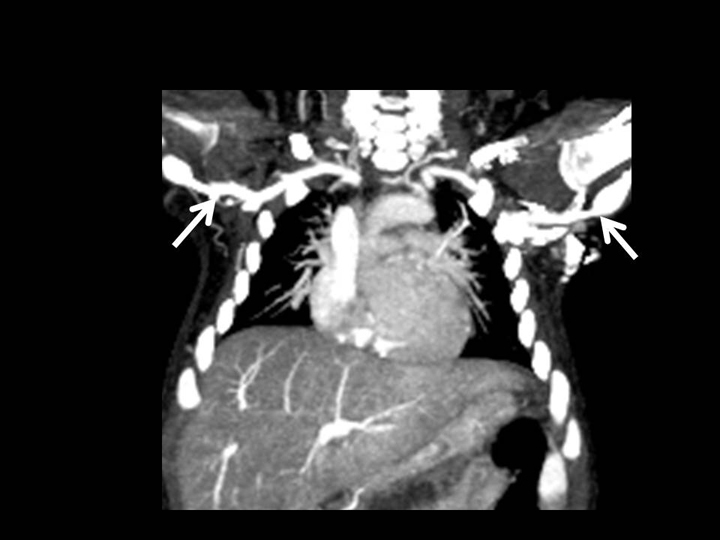 Small coronary aneurysms (< 5 mm) may regress, while larger ones may remain unchanged or progress to stenosis.1 A low-dose CT scan on a fast helical scanner, such as the Somatom Definition AS 64, is able to confirm the diagnosis of coronary artery and systemic artery aneurysms in Kawasaki disease. Treatment includes intravenous immunoglobulins (IVIG), high dose steroids, prostaglandins, Infliximab (Remicade), which works by binding tumor necrosis factor alpha, and aspirin. Infantile Kawasaki disease is often resistant to therapy and carries a high mortality.2 The peripheral ischemia and gangrene progressed in our patient despite therapy. We present a patient with infantile Kawasaki disease with coronary and systemic arterial aneurysms. Fast helical CT scanning was able to provide excellent delineation of anatomy with very low radiation dose, allowing for prompt treatment. Chung CJ, Stein L. Kawasaki disease: A review. Radiology. 1998; 208:25-33. O’Connor MJ, Saulsbury FT. Incomplete and atypical Kawasaki disease in a young infant: Severe, recalcitrant disease responsive to infliximab. Clin Pediatr (Phila). 2007;46: 345-348. Yacoe ME, Dake MD. Development and resolution of systemic and coronary artery aneurysms in Kawasaki disease. AJR Am J Roentgenol. 1992:159:708-710. 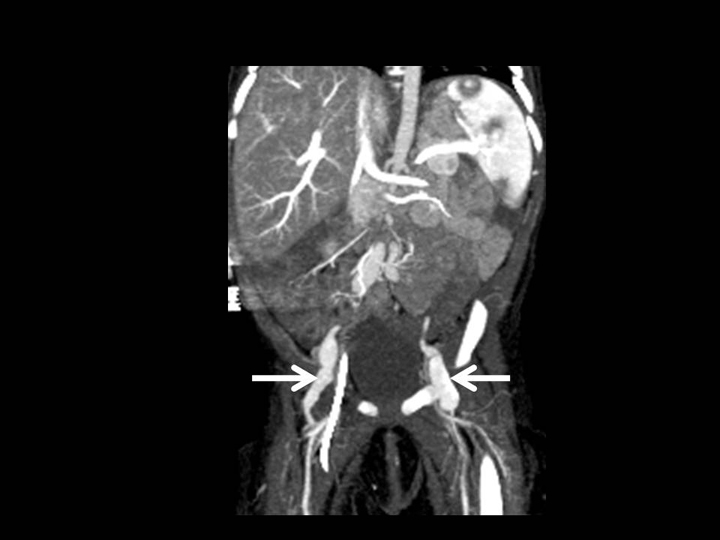 Cura MA, Haska ZJ, Weintraub J, Benvenisty A;SIR 2004 film panel case: Systemic artery aneurysms in Kawasaki disease. J Vasc Interv Radiol. 2004:15:1009-1011. Durall AL, Phillips JR, Weisse ME, Mullett CJ;Infantile Kawasaki disease and peripheral gangrene. J Pediatr. 2006;149:131-133. 12-week-old female infant with fever and rash. Appl Radiol.